A postcard, photo mechanical print of the Jamieson Valley and the Three Sisters in Katoomba. The front of the postcard features a coloured drawing of a cliff with shrubs and trees on its top and at its base. In the 11mm white border beneath the image there is text in black ink on the left reading 'Jamieson Valley and the?Three Sisters.' below this 'Sole agent: G. Giovanardi-Sydney. NO 17.' 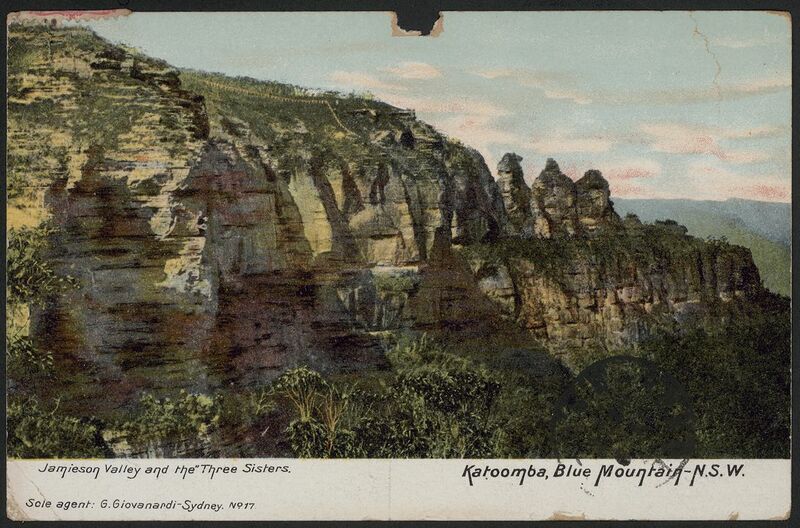 and on the right 'Katoomba, Blue Mountain-N.S.W.'. On the reverse of the postcard there is a message to the recipient 'Miss Linda Hall'. In the top right corner on the reverse there is a 1 pence New South Wales postage stamp in red featuring the New South Wales coat of arms. This postcard was sent to Linda Hall, West Maitland, New South Wales, Australia in 1908.